During our life on the road we (especially Sander) have been riding quite some different motorbikes. Here is the story how we got to where we are right now. The day before Christmas 1999, Sander got his motorcycle driving license. But it would take a couple of years before he was able to buy his own motorbike. A Yamaha XVS650 Dragstar (Or V-Star as it is called in the US) an aircooled v-twin. At the time he bought the bike a brand/type club was being formed in the Netherlands. In those early days he did quite a lot of trips. Soon he noticed the bike wasn't the most suitable for two up. So on the 13th of februari 2004 he bought the bigger XVS1100. And totalled it 3 months later. A car in front of him was braking unexpectedly for a couple of crossing ducks. With about 80km/h he hit the left end of the car, spinning it into the adjacent ditch. Luckely Sander only had an injured knee, which did require two times of surgery. With the help of a clubmember the bike was restored. Metallic blue with a lot of bling bling. Totally unsuitable for the Dutch climate. So after just one winter all chrome was flaking off the metal. The bike was rebuilt once more. This time in a more army like style including ammo cases as panniers. With it he had quite a lot of nice trips. The dream of travelling by bike was growing. And deep down inside Sander knew this bike wasn't the most suitable of all. After seeing Long Way Round he knew something had to change. 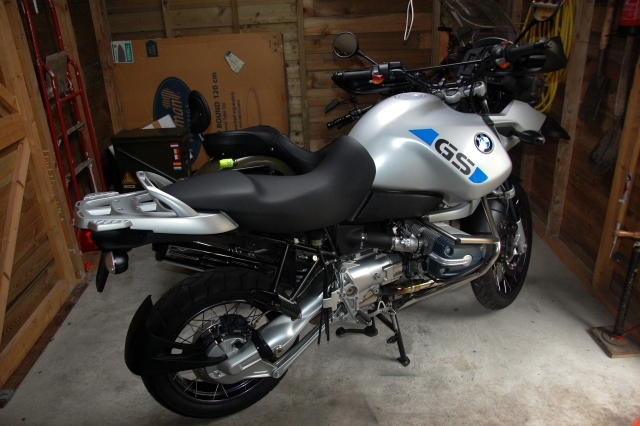 He did a couple of test drives on the BMW R1150GSA and liked it so much that he went to BMW country to get his own. He imported this fine looking specimen. Which he took offroad the same year. The bike felt too heavy, Sander was affraid to drop it and discovered there was something like a R100GS. A much older bike, simpeler and above all lighter. Something he wouldn't bother about dropping. And so it happend a nice bumblebee was bought. This was going to be the bike for the trip. WRONG! In 2010 Sander and Marianne met. And just after one trip on the back of the BMW R1150GSA, Marianne thought it would be a good idea to get a driving license herself. After succeeding she bought her own bike. And although Sander told her to buy something light she got home with a Suzuki Bandit GSF650 because it was blue. Weighing almost as much as the BMW R1150GSA and not differing much in horsepower either, not exactly what Sander had in mind. In 2011 we went to Nordkapp in Norway, with the Bandit and the R1150GSA. Marianne got so accustomed to the silky smooth four cylinder engine. That after a test drive on the R100GS, Sander wasn't very confident that the old BMW was a good bike for Marianne. So we went looking for a couple of alternatives. Till we tried the Honda XL600V Transalp. Marianne took off with much confidence and we knew we had found our bike. During bike preparations we discovered the Transalp was actually lowered by jamming a low profile tire to the rear rim. We took the bikes for a test drive to Romania. Apart from a faulty regulator on Sanders bike everything was looking good. With a lot of confidence we started our journey in march 2013. Until Congo we haven't had any problems with the Hondas. And then it went pear shaped. We got stuck between borders and had to transport one of the bikes to the capital of DRC. By chance we met a Dakar rally driver who helped us to continue our travel. But in South Africa we had trouble again. This time the other bike was having issues. But when we examined both bikes, we discovered that at least one engine was ruined. Maybe it hadn't been good from the start and for sure the sand and dust in Congo hadn't helped a lot. But the fact was that Sander wasn't enjoying maintaining the bikes. So we decided not to fix them, fly back to the Netherlands to buy a couple of BMW R100GSes.